Fairtrade Gold vs Fair Trade Gold: What's in a Name? 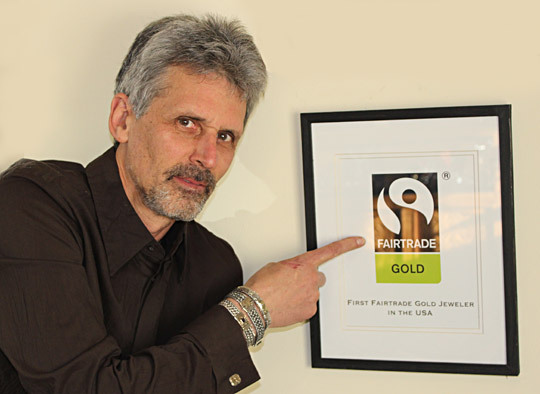 Above: Marc Choyt, President of Reflective Jewelry, poses with his Fairtrade Gold certification. In context to the marketing and usage of the terms ‘Fairtrade’ and ‘fair trade,’ we see the seeds of market chaos quickly growing into a jungle of babble. 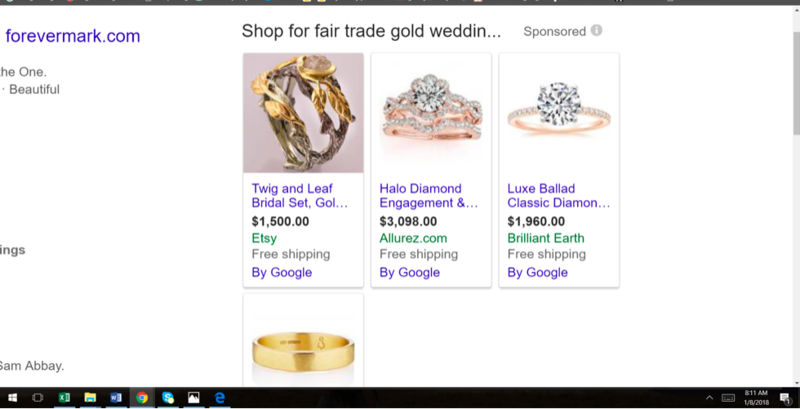 Just do a quick Google search using combinations of the terms ‘fair trade gold,’ ‘wedding rings,’ and ‘jewelry.’ You’ll see a variety of products linked back to a website that does not sell anything close to Fairtrade or fair trade gold. Yet the issue is even more complex and nuanced, because sometimes the gold used in fair trade gold does = Fairtrade Gold. How can you tell whether a company is telling you the truth versus misleading you with a product that has nothing to do with fair trade at all? I’ve written this article to help you cut through the ‘fair-washing’ spin and also to clarify our position-- steps we've had to take to maintain our own integrity in this whole process. "Check out Fair Trade USA's recipe list as well as Fairtrade America's product portal for some ideas." Fairtrade America is part of the Fair Labeling Organization (FLOCert). Fair Trade USA was part of that same network, until they broke away in 2011. Though Fair Trade USA does not sell gold, both organizations still source from many of the same producers. The difference is that 'fair trade' is a general term that anyone can use to describe a set of principles. ‘Fairtrade’ is a trademarked term owned by FLOCert. The term and its associated logo (which looks like a modified yin/yang symbol) represent a network of independent Fairtrade organizations that work within their own country. Together, form a major global brand. The Fairtrade mark— in context to gold, chocolate, coffee, etc— provides a guarantee that a product has been produced in accordance with strict FLOcert standards and principles. Fairtrade International’s standards also dictate where and when the term ‘Fairtrade’ and its associated trademark can be used. Any product sold as ‘fair trade’ by Fair Trade USA is going to have certified standard similar to those used by the FLOCert network— because, as I mentioned earlier, Fair Trade USA was once part of FLOcert. However, in general usage, the term ‘fair trade’ does not have any particular veracity attached to it— it can be used by anyone in any context. For example, none of these companies listed in this ‘fair trade gold wedding ring’ Google search sell Fairtrade Gold wedding rings. Yet the key words ‘fair trade’ are utilized as link bait to draw customers to their websites. Unfortunately, this kind of marketing hurts producer communities that need fair trade. It is a kind of ‘fair-washing’ that dilutes the power of ‘fair trade’ by undermining its meaning in the market. At this point, the difference between fair trade gold and Fairtrade Gold may appear somewhat straight-forward— but the difference gets even more layered and complex. For instance— at Reflective Jewelry, we describe our product as either ‘Fairtrade Gold’ or ‘fair trade gold.’ Allow us to clear things up! Our ‘Fairtrade Gold’ and ‘fair trade gold’ are the exact same material, and come from the exact same sources. Initially, it was Sotrami. Over the last year or so, it's been Macdesa. Both mines are located in Peru. The difference between the two terms, "fair trade" and "fairtrade" exists in name only— we separate these two terms to be contractually compliant with rules dictated by FLOCert. Our main product is two-tone gold-over-silver jewelry. I raised the issue of how to apply the Fairtrade mark to this product in my initial application to be certified back in April, 2015. Given supply chain challenges, we were at first only able to purchase 24K Fairtrade Gold casting grain— and even this came with great difficulty. We used this material to create bi-metal (gold soldered over silver) sheets, from which we made the designs used in our two-tone jewelry. Between our initial signing on to the be the first US certified Fairtrade Gold jeweler in April, 2015 and the spring of 2017, we were stamping our two-tone gold-over-silver jewelry with the Fairtrade stamp, as directed. Pictured here are some of our more popular solid gold and two-tone, gold-over-silver designs. We actually had created a complex and expensive accounting system to accommodate tracing and tracking this gold through our 3,000+ piece inventory. We sent reports to Fairtrade America detailing exactly how much gold we used, and which designs used that gold. In the spring of 2017, Victoria Waugh, who ran the international Fairtrade Gold program out of Fairtrade UK, told us we could no longer use the term ‘Fairtrade’ in context to our two-tone, gold-over-silver designs unless we stamped the Fairtrade logo on the gold design itself. This was somewhat of an astonishing hoop to jump through. Having the Fairtrade logo prominently on the front of our designs, where we use our gold, would obviously ruin these designs. (Just imagine a stamp on the front of this ring.) Typically, hallmarks are found on the back of jewelry— which differs from bananas and packages of nuts. 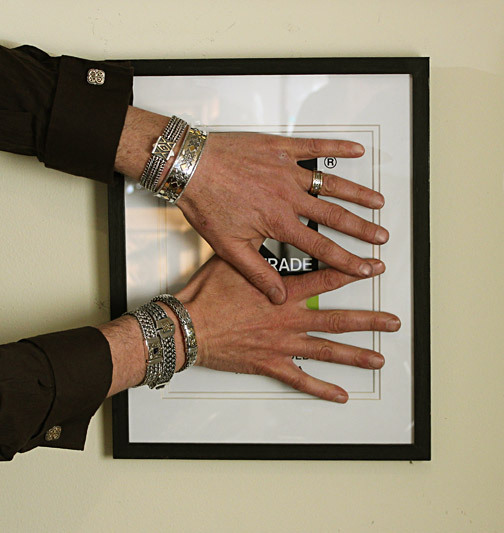 Marc, wearing fair trade gold over sterling silver bracelets, covers the Fairtrade logo. Second, for reasons outlined below, ‘fair trade gold’ may at some point in the future described Fairtrade Gold in North America by other jewelers— a direct result of Fairtrade America’s policy. Now, back to the matter at hand— is there any difference between the fair trade gold and Fairtrade Gold used in Reflective Jewelry? The foundation of Fairtrade Gold is the auditing process. Jewelers who use the Fairtrade trademark must track and trace the gold from their supplier through to the product. The only difference between our ‘Fairtrade Gold’ and our ‘fair trade gold’ is that the former, which we use in our solid-gold pieces, is subject to an audit (which comes with a $1.80-per-gram additional administrative fee that goes to Fairtrade Americ a). To be clear, the fair trade gold we use in our gold and silver pieces is still tracked through our system and guaranteed by us— but is not subject to an audit or guaranteed by Fairtrade itself. In these situations, we are somewhat analogous to a small farmer who is organically certified. One has to trust that they are not spraying their plants with Roundup. Whether we label our gold 'Fairtrade' or 'fair trade,' it supports producer communities equally. As of October 2017, Hoover and Strong, a major jewelry supply house, began offering Fairtrade Gold. However, in the spring of 2018, they ceased stocking the gold. My understanding is that they are going to resume stocking fairtrade gold around August, 2018. Any jeweler can purchase this gold, whether they are certified or not. The paperwork and cost for a jeweler to be certified by Fairtrade America are prohibitively expensive to most small shops— I paid $1,532 back in 2015 to become certified. As of June, 2018, I am still the only certified Fairtrade Gold jeweler in the US. In the US, small jewelers in the US who want to purchase certified Fairtrade Gold have incentive to sell outside of the FLO auditing system. They can avoid the cost and considerable paperwork. Their customers won’t know the difference—they will just be purchasing the same ‘fair trade gold’ anyway. However, according to Fairtrade America, they might open up a free entry small jewelers scheme with Hoover and Strong. When this might take place -- I have no idea. Fairtrade is not called "Slow FLO" for nothing and Fairtrade America basically don't communicate with me in context to gold outside of sending me invoices. Using Fairtrade gold outside of the FLO system in the US will work for small companies whose customers trust them, but it undermines the greater movement to change the jewelry sector in the US through a powerful global brand. Fairtrade America is part of the FLO network. Every FLOcert member works independently, free to set up trading arrangements. Ironically, when Fairtrade America decided to adopt their current platform, they undermined a vibrant fair trade gold market in the US and sowed the seeds of additional market chaos. Most tragically, the obstacle to trade has also meant a huge loss of potential market in the US— the largest jewelry market in the world— for impoverished miners. 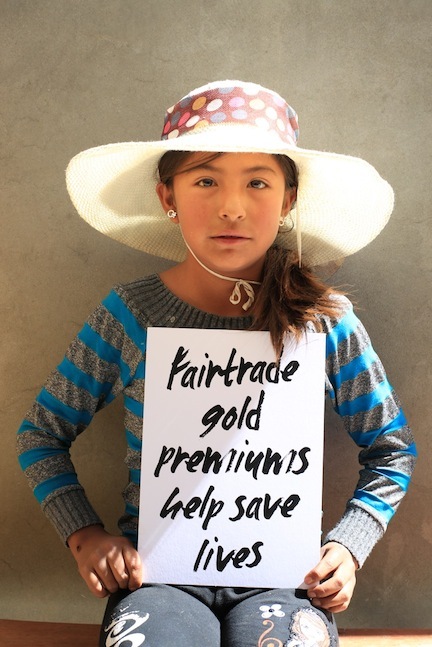 For Reflective Jewelry, Hoover and Strong’s move to offer all their products in Fairtrade Goldallowed us to move forward with our goal of using 100% Fairtrade (and fair trade) gold at least for a time. Hopefully this will resume later in 2018. The situation is kind of fluid. Fairtrade Gold wire, sheet, and small jewelry parts— such as earrings posts and back, bezels, etc— will hopefully become available thanks to Hoover and Strong’s move. This is a great step forward, because it means we can make most everything in our shop using Fairtrade Gold (with the exception of the two-tone pieces mentioned above).